The country could miss the biggest event in international football for the first time since 1970. THE WORLD’S TOP-RANKED football nation Argentina risk failing to qualify for the World Cup for the first time since 1970 after Lionel Messi’s suspension and a humiliating defeat to Bolivia. The two-time world champions’ woes deepened just as the Argentine Football Association (AFA) named new executives yesterday. They are ostensibly tasked with ending three years of turmoil in the Argentine game, but analysts said the appointments were politically influenced. The defeat by Bolivia sparked press rumours that one of the new AFA management’s first moves may be to fire coach Edgardo Bauza. But it may be too late to get La Albiceleste on the plane to Russia to entertain fans across the globe at next year’s World Cup. 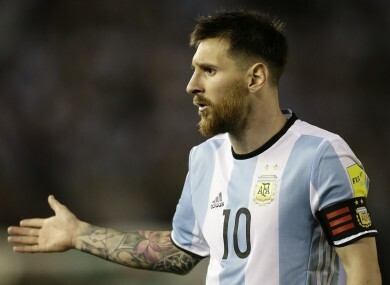 Fifa hit Argentina’s star striker Messi with a four-match ban on Tuesday for swearing at an assistant referee in a game against Chile last week. “Four games is outrageous. There are malicious fouls that only get a two-game ban, and this was just verbal abuse,” said former Argentina coach Cesar Menotti. Argentina’s World Cup hero Diego Maradona said he was ready to lead an appeal to Fifa against Messi’s ban, but it is rare for the sport’s governing world body to repeal a suspension. Like it or not, then, Messi will be out of three of Argentina’s four remaining World Cup qualification matches, having served the first game of his ban on Tuesday. His absence forced a hasty reshuffle by Bauza to the starting line-up against Bolivia. Struggling in the thin mountain air of La Paz under stand-in captain Ever Banega, they slumped to a 2-0 defeat. They dropped from third to fifth place in the regional table — out of the top-four automatic qualifying positions. Argentina have won only one of eight World Cup 2018 qualifiers played without the Barcelona superstar, compared to five out of six won with him on the pitch. Compounding their woes, their defender Ramiro Funes Mori of Everton was stretchered off the field with a knee injury. Argentina have been undermined by a broader crisis afflicting the Argentina game, tangled up with politics. A power struggle broke out after the death of former AFA president Julio Grondona in 2014. Email “Argentina crisis: Messi ban, humiliating defeat and World Cup qualification in doubt”. Feedback on “Argentina crisis: Messi ban, humiliating defeat and World Cup qualification in doubt”.